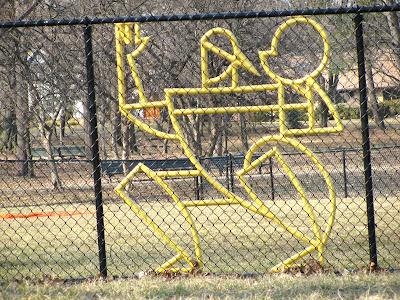 A Yellow baseball catcher on the fence. Ha! Happy Mellow Yellow Monday! Go over to see Drowsy Monkey for other participants. Very cool! Great "catch" ;-). Ohhh...I would have never figured that out if you hadn't told me! LOL I lack imagination, clearly. BTW - You had the wrong link on mr linky-but I fixed it. Very cute. Isn't it amazing now how many things we find to take pictures of to post on our blogs? What a great catch! ... I am so original, huh! That's so funny! Great find for Mellow Yellow Monday. Love this. How could anyone not. What a great photo to bring a smile to one's Monday. Really a cool piece of artwork and so great for a mellow yellow monday!! Makes you want to go out and play baseball. Thanks for sharing and have a great day! Ah, noe I see it! What fun. this is great! every ball field should have one! Oh, I love the fence art. What a great photo for mellow yellow. Glad to see the green glasses again. That is so cute! Very different... Never seen anything like it. What a wonderful find!!! I love this shot. I played at Happily Retired Gal and Small Reflections on Monday but haven't had time to visit until today. This is the first time I come to your blog.